The legislation signed this week by Gov. Jerry Brown is just one example of actions by California’s Democratic lawmakers and policymakers to distance themselves from Trump. Some are mostly symbolic, like resolutions calling for congressional investigation and censure of the president, while others chart an independent course for the state in protecting undocumented immigrants and combatting climate change. AB491, which takes effect in January, provides $3 million over the next three years for educational projects that link the mass lockup of Japanese Americans to ongoing “civil liberties injustices” against racial, religious or sexual minorities or immigrants. As latter-day examples of President Franklin D. Roosevelt’s 1942 internment order, the legislation cites Trump’s orders prohibiting U.S. entry of anyone from selected countries with mostly Muslim populations, and his campaign promise to ban Muslim immigration. “It ties the World War II Japanese incarceration experience to what we see happening today,” said the bill’s author, Assemblyman Al Muratsuchi, D-Torrance (Los Angeles County). The Legislature passed AB491 before the latest revision to Trump’s travel ban with the additions of North Korea, Chad and government officials in Venezuela, prompting the Supreme Court to cancel a scheduled Oct. 10 hearing on the constitutionality of his previous order. But the bill is only the most recent in a series of legislative swats by California’s majority Democrats against the Republican president. In early September, the Assembly passed a Democratic-sponsored resolution, HR57, calling on Congress to censure Trump for his blame-both-sides response last month to the violent white-supremacist march in Charlottesville, Va., which, the resolution said, showed he was “unfit to be a moral leader.” In addition to the Assembly’s full slate of Democrats, the measure had the support of two Republicans, Catharine Baker of San Ramon and Brian Maienschein of San Diego. In March, the state Senate passed another resolution, SR23, along party lines, calling for a bipartisan commission to investigate connections between Trump’s campaign or administration and the Russian government. It also demanded that Trump shed light on any conflicts of interest he might have by releasing his tax returns. More substantively, legislation on Brown’s desk, SB149 by Sen. Mike McGuire, D-Healdsburg, would bar presidential candidates from having their names on the California ballot unless they released five years of tax returns. On a more far-reaching issue, Attorney General Jeff Sessions’ threat to punish California as a “sanctuary state” for unauthorized immigrants drew a defiant response from state legislators, who passed measures further restricting local police from cooperating with federal immigration agents, prohibiting landlords from reporting tenants to immigration officers, and barring immigration officers from entering workplaces without a warrant. Those bills also await action from Brown. State lawmakers have also approved $30 million in legal and financial aid to immigrants brought to the U.S. illegally as children, whose protection from deportation Trump has proposed to eliminate. They have voted to ban contracts with the federal government to hold inmates in local jails or private prisons. And for good measure, they voted to name part of a state highway in Los Angeles County after former President Barack Obama. “When the Trump administration is infringing on the rights of Californians, we’re not going to be afraid to challenge that, whether that’s through legislation or, as the attorney general (Xavier Becerra) is doing, through the courts,” said Kevin Liao, spokesman for Assembly Speaker Anthony Rendon, D-Paramount (Los Angeles County). Becerra has filed arguments supporting the challenge to Trump’s travel ban and has also sued the administration over air quality, immigration and the proposed border wall with Mexico. Brown, meanwhile, has responded to Trump’s withdrawal from the Paris climate accord by convening his own international summit on global warming, in San Francisco next September, and promoting a worldwide alliance of government leaders committed to reducing greenhouse gas emissions. The bill he signed Tuesday, AB491, expands an educational program that began in 1998 under legislation sponsored by then-Assemblyman Mike Honda, who was a year old in 1942 when he and his family were sent to one of the internment camps that held 120,000 Japanese Americans captive during the war. Following a U.S. government apology and compensation payments to the internees under President Ronald Reagan, the California program offered grants from the state librarian’s office to community groups and nonprofits for presentations on the internment, the fears that gave rise to it and the civil liberties it violated. The most recent grant recipients included producers of films, plays and museum exhibits on the internment, many of them designed for student audiences. A Los Angeles musical organization trained young students to perform in an opera, set in one of the camps. In San Francisco, the Fred T. Korematsu Institute, named for the Bay Area man who challenged Roosevelt’s internment order, had a state-funded media project on the impacts in California, where the largest number of internees lived. 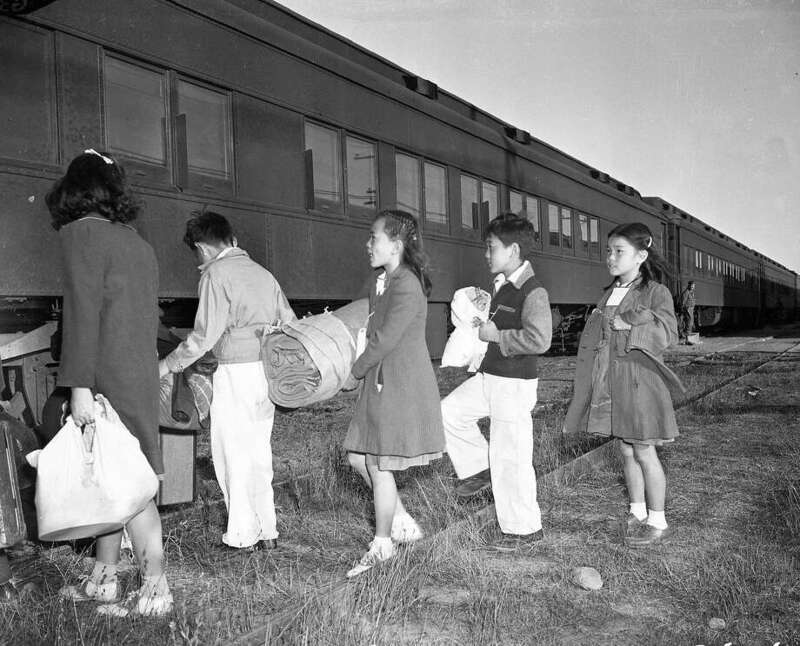 AB491 will award funds to educational programs that draw connections between the internment and current threats to civil rights. The reference to Trump and Muslim immigrants — which drew some Republican opposition when it was added in a state Senate amendment — would allow, but not require, the librarian’s office to fund projects that compared the president’s current agenda to the abuses 75 years ago. It’s not a far-fetched comparison, said Muratsuchi, the bill’s author. He noted that the children of Korematsu and of others who challenged the internment had recently signed onto legal arguments opposing Trump’s travel ban.